WAIT until the 2008 presidential election and hope that sense prevails. That, roughly, is the West’s strategy to deal with Russia. It has come at a high price. Russia has largely won the gas wars before most Europeans even noticed they were being fought. So far this year the Kremlin has stitched up the Caspian (by striking a pipeline deal with Turkmenistan and Kazakhstan). It has nobbled Austria, Belgium and Hungary (to add to its powerful position in Germany, France and Italy). By schmoozing other producers it has begun to form a gas cartel. Russia has also built a strong pro-Kremlin camp elsewhere in the European Union (Greece, and Cyprus chiefly; Hungary, Latvia and Slovakia increasingly; and probably Bulgaria too if anybody looked closely). Its banks and businesses have created a fifth column in the City of London and other world financial centres. For a start: is Russia a fit member of the G8? Clearly not. Russia was admitted to the then G7 to bolster Boris Yeltsin’s attempt to make Russia democratic, free and friendly. That was probably a mistake; it has obviously failed. So either exclude Russia on the ground that the G7 is a democracies-only club, or include China and make it a big-economies club. Stop Russian companies from using the international capital markets unless they have clean hands. Conniving in the sale of stolen property is a crime. Why should a Russian oil firm with looted assets (or a gas intermediary whose business seems to consist mainly of standing in the right place) enjoy the privilege of raising capital in London? Equally, the European Bank for Reconstruction and Development should stop its “rent-a-fig-leaf” service to Russians who want to look respectable. Given the colossal amounts of cash sloshing around Russia at the moment, it is preposterous that Western taxpayers are asked to finance anything there. Crack down on visas. If a Russian tycoon is unwelcome in America, should he be be any more welcome in London? Even better, start chucking people out. Imagine the impact if America, Britain, France, Germany, Canada and Italy—and any other countries that wanted to join in—expelled, on the same day, equal numbers of Russian spies. Say 15 each from the GRU (military intelligence) and from the FSB and from the SVR (the successors to the KGB). The spying, stealing and mischief-making by these outfits matches or even exceeds levels seen in the cold war. So, show some cold-war resolve, and do it in unison. More tough-mindedness would be useful in other places too, such as in Western countries’ foreign ministries. For the past 20 years, officials dealing with Russia have been promoted if they encourage trade, investment and friendly political relations. Hawkishness has been a career-killer. That doesn't help now that a tough, consistent policy is needed. Counterattacks are possible, but tricky. Security firms' staff can pose as hackers to infiltrate cybergangsterdom. This used to be a mere battle of wits. Now there are real fears of violence. “It's changed now that big money is involved. It is not beyond the realm of imagination that someone might be targeted,” says Mikko Hyppönen of F-Secure, an internet security firm. FOR those hoping for political calm in Romania and Bulgaria, the European Union's newest members, last weekend was a reasonably good one. The Romanian president, Traian Basescu, won 74% in a referendum on his impeachment on May 19th, wrongfooting the minority Liberal-led government that suspended him. The prime minister, Calin Popescu Tariceanu, now concedes that the vote was a “waste of energy and money”. What happens next depends largely on the Socialists, heirs of Romania's Communist Party. With 150 deputies, they are the largest party in parliament. The ruling coalition of Liberals and the Hungarian minority musters only 109. The best outcome would be an early election, perhaps to coincide with a European one this autumn. This is backed by Mr Basescu's Democrats, flushed with their referendum victory. One deal has the Socialists backing an early poll and dumping their more egregiously corrupt members in return for a big role in a post-election government. Failing that, the Socialists might team up with the battered Liberals, in return for Mr Tariceanu's job. In theory, the Liberals could also continue with their minority government until the scheduled election in autumn 2008. But their plunging popularity suggests this would be unwise. On current form, they could even miss the 5% threshold for parliamentary seats. Amid his enemies' confusion, Mr Basescu should be preparing for a glorious return to the Cotroceni Palace. But his triumph was marred by scandal. On the day of the referendum, Mr Basescu was hassled in a supermarket by Andreea Pana, a journalist who tried to film an interview on her mobile phone. Mr Basescu lost his temper, insulted her and grabbed the phone, telling her she could have it back on Monday. Unaware that it was still recording, he complained to his wife in the car about the “aggressive, stinking gypsy”. Ms Pana, as it happens, is not Roma (gypsy) by ethnicity. But the incident reveals Mr Basescu's common touch (sometimes a strength) and his short-tempered manner (definitely a weakness). Many liberal-minded Romanians, including those who support his policies, condemned him; he has apologised. The scandal will dent his image among foreign admirers. What would impress them would be a statesmanlike push in the battle against corruption. The EU is to issue a progress report on Romania and Bulgaria on June 27th. Both countries are struggling to root out corruption. In Romania the problem is distraction; in Bulgaria it reaches the heart of government. The prosecutor-general, Boris Velchev, promises early indictments in a case involving a top government man. Bulgarian voters would like that. They shunned the coalition in a European election on May 20th. The winner was a party led by a populist conservative mayor of Sofia, Boiko Borisov, running on an anti-corruption ticket. But, as Mr Basescu's fortunes show, getting elected on a clean-government platform is one thing; making a lasting difference is much harder. “COMMUNISM is Soviet power plus electrification.” Lenin’s quote pretty much summed up 1945-91 for the Baltic states. It meant, on the one hand, dictatorship, mass murder, deportations, Russification, the trashing of languages and cultures, the defacing of cities and the countryside devastated by collectivisation. On the other hand were some modern power stations. Chiefly one: Lithuania’s Ignalina nuclear reactor was, at its pre-Chernobyl peak, the largest in the world. Now Soviet power is a fading memory—and electricity supply is at risk. At the time of the struggle to regain independence, Lithuanians hated Ignalina. Now that it’s theirs, they feel differently. But the European Union wants to close it, and the Lithuanian government has reluctantly promised to do so by 2009. The costs of decommissioning are eased by hefty EU subsidies. But that’s not the problem. Ignalina generates 80% of Lithuania’s power and also exports electricity to neighbouring countries. A replacement, to be jointly built by Lithuania, Latvia, Estonia and Poland, exists only on paper and won’t be running until 2015—according to optimistic estimates. That gap will be filled by burning extra gas and oil, supplied from Russia, and importing electricity, probably also from Russia. It is hard to imagine that this will come without political strings attached. Lithuania will be negotiating with Russia from a position of weakness. Even if the EU doesn’t mind that, it should shudder at the thought of the millions of tonnes of unwelcome carbon dioxide emitted by burning substitute fuels. The effects of the EU’s nuclear-phobia have already been visible in the Balkans. Forcing Bulgaria to close two reactors at Kozloduy as a price for joining the EU forced that country to slash electricity exports to the western Balkans, causing power shortages in Albania and Macedonia. Bulgarian officials warned the EU about this; seemingly, nobody was listening. To avoid a similar mess in the Baltic region, the obvious solution is to extend the life of Ignalina for another ten years, at least until the new nuclear power plant comes onstream. This should be a simple choice. Proceeding as planned is dirty, dangerous and expensive. It means more carbon emissions; it endangers the EU’s energy security in one of the most vulnerable member states; and it will cost a lot of money that could be better spent elsewhere. Keeping Ignalina open costs nothing except the pride of some twitchy green-tinged bureaucrats and politicians. By retreating from a hastily-adopted and out-of-date position, the EU will gain lots of clean energy in a place where it is needed, and shore up European solidarity in a region where it is sorely lacking. What about safety? It is worth remembering that Ignalina’s oldest and riskiest reactor was closed in 2004. The one still in operation bears little resemblance to the Soviet-era monster that Lithuania inherited. Your columnist remembers a trip there in 1992. The control room was thick with cigarette smoke. Cables in inflammable PVC sheaths looped crazily from the ceilings in the endless corridors. The visitors were allowed to stand on top of the reactor core, steam gently hissing from what they were assured was an “unimportant” pipe. Now the plant has been modernised by experts from Sweden (which is downwind of the plant, and has a close interest in its safe operation). Electronics and control systems have been overhauled. The staff have been retrained. Ignalina can run safely for another decade. Lithuania, commendably, doesn’t want to be seen as reneging on a deal. But this promise was extracted under duress, and the costs of keeping it are preposterously high. The government should reopen talks on Ignalina. And the EU and its member states should back down. Do not read further if you want balanced commentary and thoughtful nuance. This piece is written for a mass-circulation tabloid. Many other things could and should be said on this subject. It does not represent the view of The Economist, and certainly not of my colleagues there. But it comes from the heart. Murder on our streets. Blackmail over oil supplies. 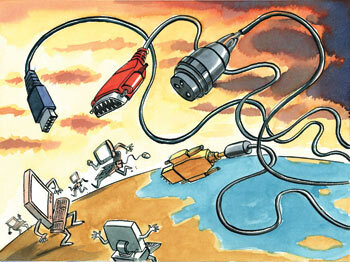 Cyber- terrorism. Putin's Russia poses a grave threat to our way of life. So now it's official: the nuclear terrorist attack on the streets of London that killed Alexander Litvinenko and contaminated 17 others was not by 'person or persons unknown'. The British authorities have publicly named the man many have long seen as the prime suspect: Andrei Lugovoy, a multi-millionaire ex-KGB agent with close ties to the Kremlin. His trail leads through London and Hamburg, marked by traces of Polonium-210, the lethal radioactive isotope that condemned the Russian defector to a grisly death. Mr Lugovoy vehemently protests his innocence. Was he set up by the real assassins? Or was he a bungler? Professional KGB killers would never have left so many clues. Maybe the Kremlin wanted to send a powerful message, condemning a man they saw as a traitor to a slow, agonising and public death? And how serious was Mr Litvinenko, with his increasingly wild allegations of paedophilia in the Kremlin and Russian support for Al-Qaeda? In spy novels, such puzzles are neatly unravelled by the end of the story. But this real-life thriller has only just begun, and there are few answers to any of the terrifying problems that it poses. The truth is that Russia, under Vladimir Putin, has become a nation that matches the resources and ambition of a superpower with the ruthlessness and ingenuity of gangsters and terrorists. As even the most sentimental and feeble-minded westerners are beginning to realise, Russia poses a profound threat to our way of life, and one that we are still pitifully ill- equipped to counter. The first and most blatant weapon in its armoury is murder. As Paul Joyal, a prominent American expert on intelligence and Kremlin dirty tricks - and a friend of Mr Litvinenko's - said on an American television programme: "A message has been communicated to anyone who wants to speak out against the Kremlin: 'If you do, no matter who you are, where you are, we will find you and we will silence you - in the most horrible way possible.' "
A week after that interview was broadcast, Mr Joyal was gunned down outside his home near Washington DC. Initial reports said it was just a sinister coincidence. Mr Joyal himself, his internal organs torn to pieces by the attacker's bullet, was in a drug-induced coma for nearly a month. Since then he has said little. But when I spoke to him, he said that the behaviour of the attackers and the fact that they left his wallet, briefcase, computer and car (as well as other objects that must stay confidential for now) mean it is virtually impossible that it was mere street crime. That suspicion might also be shared by America's FBI, which - highly unusually - is assisting the local county police in their investigation. Kremlin death squads have killed others. Zelimkhan Yandarbiyev, an exiled Chechen leader, was blown up in February 2004 in the Qatari capital, Doha, along with two bodyguards and his young son. The perpetrators - officers in Russia's elite GRU military intelligence service - were caught, tried and imprisoned. As part of a deal with Russia, they were returned home, supposedly to serve out the rest of their sentences. Instead, they received a heroes' welcome and were released. So much for legality in Russia, a country that has passed a law authorising the murder of its enemies abroad. The definition of enemies, incidentally, includes "extremist" - a word that Russian officials use to describe anyone who disagrees with them. Russia shows a similarly cavalier attitude to its business dealings with the outside world. Tearing up contracts without the slightest hesitation, it uses blackmail against its neighbours in a way that would have been unimaginable even in the depths of the Cold War. Lithuania and Estonia, two brave Baltic nations that cast off the shackles of communist tyranny in 1991, are in the front line of Russian energy sanctions. A vital oil pipeline to Lithuania's Mazeikiai oil refinery - the mainstay of that country's economy - has been cut off, supposedly for urgent maintenance. But the repair works have been going on for nearly a year and are set to continue indefinitely. When Lithuanian officials protested, a senior Russian visitor told them: "Sorry, you should have sold the refinery to us" (Lithuania had sold it to the main oil company in friendly, neighbouring Poland). Among other sanctions on Estonia, Russian officials have crippled trade by closing that country's main road bridge from Russia, again claiming that it needs "urgent repairs". Given Europe's dependence on Russian energy, that is already alarming. But it is another kind of onslaught unleashed against plucky Estonia that has set deafening alarm bells ringing in Brussels and Washington. Last month, Estonia's government decided to move a Soviet war memorial in the centre of the capital, Tallinn, to a nearby military cemetery. That prompted demonstrations by local Russians, egged on by the Kremlin's spies and provocateurs, which soon turned into riots and looting. In the chocolate-box streets of medieval Tallinn, familiar to many British holidaymakers as one of the friendliest and most charming capitals of Europe, drunken Russian hooligans emptied shops and burnt cars, chanting "It's all ours" and "Soviet Union for ever". In Moscow, thugs blockaded and attacked the Estonian embassy - a flagrant breach of the Vienna convention. When the Swedish ambassador visited, they tried to turn over his car. But that was only a taste of the havoc to be wreaked in cyberspace. Estonia's most vital computers experienced a cyber-attack on a scale and ferocity unknown in the history of the internet. Techniques normally employed by cyber-criminals, such as huge remote-controlled networks of hijacked computers, were used to cripple vital public services, paralyse the banking system and cut off the government's websites from the outside world. By cutting Estonia off from the world, the Kremlin's propagandists could freely peddle their poisonous lies about a "fascist revival" in this peaceful, prosperous and democratic country. Luckily for us, Russia's goons and spooks have overplayed their hand. Outrage in Germany about the way Vladimir Putin's thuggish regime crushes opposition and bullies its neighbours makes it easier for the steely Chancellor, Angela Merkel, herself a former inmate of the grim Communist prison camp of East Germany, to show her own distaste. The European Union's summit with Russia in Samara last week was a frosty affair - a welcome change from days of Silvio Berlusconi, Jacques Chirac and Gerhard Schroder, infamous for their sleazy backslapping with Russia's leaders. But we in Britain have yet to catch up - thanks, paradoxically, to our open, globalised economy. Russia's energyfuelled wealth has given it a vital bridgehead, creating a powerful lobby of banks and business partners that overlooks any crimes in the hope of profit. BP's imminent loss of its most prized investment in Russia, the $6 billion Kovykta gas field, is a punishment for the British authorities' temerity in charging Mr Lugovoy. That shows how high the stakes are. Even now, the Kremlin's slimy spin-doctors are trying to downplay the Litvinenko murder: he was a "provocative" figure, one of them murmured to me. But since when has being "provocative" attracted a death sentence, meted out without judge or jury on the streets of London? The dismal truth is this: during the Cold War, capitalists and freedom-fighters were on the same side. Now that Russia has adopted capitalism - albeit its own barbarous version - a fifth column has marched straight into the heart of the British establishment. What will it take to counteract it? So Poland is facing a “Labour shortage”. True, in that Polish employers can’t find the staff they need at the wage they can afford to pay. There is also a “shortage” of large houses in central London that I can buy on a journalist’s salary. There is a “shortage” of luxury sports cars, Rembrandts, Caribbean islands…you name it. The truth is that life is full of things that are not available at the price we would like to pay—or that we have got used to paying. The market has a partial answer to this. It is a fair bet that if Polish hospitals paid American salaries, it would be no problem to attract plenty of nurses, doctors, technicians and cleaners. But of course the state (or rather the Polish taxpayer) cannot afford to solve the problem just with money. Neither can Polish private-sector employers. Particularly in lower-skilled sectors, they are increasingly finding that the wages needed to attract enough workers are not matched by those workers’ productivity. So what to do? Imagine a maths teacher in Poland earning €500 a month, considering moving to Britain. The chance of earning £2,000 a month is one reason to move. Others include: quality of public services; quality of management and workplace relations; prospects for training; leisure opportunities; optimism about the future. At the moment, all of these count against Poland, creating a “premium” for living and working in, say, Britain and a “discount” for staying at home. As a Briton, I am not proud of my country’s health, education, transport, policing and other public services. They are run-down, badly managed, overcrowded and complacent. Still, I recognise that compared to most post-communist countries, they are pretty good. If you get ill in Britain, the National Health Service offers world-class medical care for free. That is not the case in Poland. Then comes the quality of life at work. Polish employers—especially in the public sector—have largely missed the management revolution of the past 40 years. Information is guarded jealously; status counts for a lot; initiative is discouraged, or even punished. “A boss is someone in a big office who shouts at people”. I personally don’t find British management particularly good (compared, say to the way Scandinavian companies are run). There are authoritarian, secretive, temperamental bosses. But I reckon they are rarer than in Poland. Then there is relationships with colleagues. Britain, along with some other north European countries scores highly in polls about “public trust”. Relations in the British workplace tend to be amiable—more so, perhaps, than in a large Polish bureaucracy. Next comes education. Polish employers tend to be rather poor investors in their staff. In Britain, particularly in the public sector, on-the-job training is part of the system. It doesn’t work very well (indeed a lot of it is a complete waste of money) but it does offer room for an ambitious newcomer to learn some more skills. Rather more importantly, Living in Britain is like taking thousands of hours of free-of-charge language lessons. Poles who work in shops or restaurants quickly polish their accent, stretch their vocabularly and improve their understanding of the world’s most important business language. You don’ tget that at home. Finally, there is the question of optimism. People will put up with a lot if they think that life is going to improve. If they feel pessimistic about their country, or their own chances there, they tend to be more willing to consider radical changes, such as moving abroad. Despite Poland’s strong economic growth rate, robust democracy and strong international alliances, the country’s incompetent and quarrelsome politicians have failed to communicate to the voters a feeling that Poland is on the right track. Put all these factors together, and it is easy to see why Polish public services are finding it hard to keep staff. They offer ill-paid badly managed jobs with few prospects, where connections matter more than talent. Quality of life inside and outside the workplace leaves a lot to be desired. Prospects elsewhere are bright. As the brightest and best people leave, conditions become steadily less attractive for those left behind. That is the bad news. The good news is that all these problems are soluble. Polish public services could improve sharply if they were better managed. 20 years since the collapse of communism, it is astonishing that so many are run without the interests of the “customers”—ie the patients, pupils, and other citizens—in mind. Estonia has revolutionised its public services by a mixture of decentralisation, liberalisation (meaning competition) and most of all e-government. It is remarkable that a country as poor and backward as Georgia has been willing to take the Estonian example on board, and launch its own radical public-sector reforms, and Poland has shown so little interest in the subject. Good public services are not just attractive to their users. They also find it easier to attract and keep good staff. Teachers like working in a well-run school. A good school makes every parent in the locality think twice about wanting to work abroad. Poland stands before an important choice. Either it makes a serious effort to make itself attractive for its own people: not just paying them decent salaries, but offering high-quality public services, if not immediately, but at least as a realistic prospect in the coming years. The aim is to tempt tens of thousands of migrants who have left provisionally to come back, enriching the country with their newly acquired skills, languages, outlook and experience. This is already happening to some extent in the private sector: people who have made some money abroad are coming home to pursue business opportunities that they have spotted. But it is not yet happening in a big way in the public sector. If Poland fails to do this, it faces a much bleaker prospect: a vicious circle of declining public services where the best people leave, the management worsens, and quality of life for everyone declines. The example of southern Italy shows what problems bad government can create: entrenched corruption, depopulation and hopelessness. Only Poland can solve this problem. European Union structural funds make the solution easier, but they do not substitute for the political will and imagination needed. Democratic pressure over the past 20 years has not really persuaded politicians that this matters. But now millions of people are voting in a different way: with their feet. That should signal the urgency of the task. Polska stoi teraz przed ważnym wyborem. Albo zdobędzie się na wysiłek i stanie się atrakcyjna dla własnych obywateli, nie tylko płacąc im godne pensje, ale oferując usługi publiczne na wysokim poziomie. Albo czeka was czarny scenariusz - pisze Edward Lucas z "The Economist"
W Polsce "brakuje pracowników". To prawda, polscy pracodawcy nie są w stanie znaleźć potrzebnych im ludzi, oferując takie pensje, jakie są w stanie zapłacić. Podobnie w centrum Londynu "brak" dużych domów wolno stojących, które mógłbym kupić za honorarium dziennikarza. "Brakuje" luksusowych samochodów sportowych, na które byłoby mnie stać, obrazów Rembrandta, Karaibów i tak dalej. A prawda jest taka, że życie jest pełne rzeczy, które nie są dostępne za cenę, jaką chcielibyśmy za nie zapłacić, albo do jakiej przywykliśmy. Częściową odpowiedzialność za taki stan w Polsce ponosi rynek. Gdyby polskie szpitale wypłacały amerykańskie pensje, to z pewnością nie miałyby problemu z przyciągnięciem pielęgniarek, lekarzy, laborantów i salowych. Ale oczywiście państwa polskiego (czy raczej podatnika) nie stać na to, żeby rozwiązać ten problem wyłącznie za pomocą pieniędzy. W podobnej sytuacji są pracodawcy z sektora prywatnego. Szczególny kłopot sprawiają pracownicy niżej wykwalifikowani - coraz częściej okazuje się, że pensje potrzebne do zatrudnienia wystarczającej ilości takich pracowników nie idą w parze z ich wydajnością. Co robić? Wyobraźmy sobie nauczyciela matematyki zarabiającego w Polsce 250 funtów na miesiąc, który rozważa przeprowadzkę do Wielkiej Brytanii. Szansa na zarabianie 2 tys. funtów miesięcznie to jeden z powodów jego wyjazdu. Inne to poziom usług, jakość zarządzania i stosunków w pracy, perspektywy szkoleń i rozwoju zawodowego, możliwości spędzania wolnego czasu, optymizm co do własnej przyszłości. W tej chwili wszystkie te czynniki przemawiają na niekorzyść Polski, składając się na "za" w kwestii życia i pracy, powiedzmy, w Wielkiej Brytanii i "przeciw" co do pozostania w domu. Jako Brytyjczyk wcale nie jestem dumny ze stanu służby zdrowia, edukacji, transportu, policji i innych służb publicznych. Są w kiepskim stanie, źle zarządzane, przeludnione i zadowolone z siebie. Ale biorąc pod uwagę, jak te służby działają w krajach postkomunistycznych, stan naszych jest całkiem niezły. Jeśli zachorujesz w Wielkiej Brytanii, Narodowa Służba Zdrowia (National Health Service) zaoferuje ci za darmo opiekę medyczną na najwyższym światowym poziomie. W Polsce tak nie jest. Macie menedżerów z lat 70. Następna sprawa to jakość życia w pracy. Polscy pracodawcy, zwłaszcza w sektorze publicznym, w większości spóźnili się na rewolucję w zarządzaniu, która przebiegała w ciągu ostatnich czterdziestu lat. Informacje są zazdrośnie strzeżone, kluczową rolę odgrywa hierarchia, inicjatywa jest niemile widziana albo wręcz karana. "Szef to osoba, która siedzi w dużym gabinecie i krzyczy na ludzi". Osobiście nie uważam brytyjskiej kadry zarządzającej za wyjątkowo udaną (porównując np. ze sposobem, w jaki zarządzane są skandynawskie firmy). Są u nas szefowie despotyczni, skryci, nieobliczalni. Ale sądzę, że jest ich mniej niż w Polsce. Dalej mamy relacje z kolegami z pracy. Wielka Brytania, podobnie jak kilka innych krajów północnoeuropejskich, ma wysokie notowania w sondażach dotyczących "zaufania publicznego". W brytyjskich miejscach pracy relacje międzyludzkie zazwyczaj opierają się na uprzejmości - być może częściej, niż to się zdarza w wielkich polskich zbiurokratyzowanych przestrzeniach. I jeszcze edukacja. Polscy pracownicy raczej nie inwestują w swój personel. W Wielkiej Brytanii, zwłaszcza w sektorze państwowym, szkolenia w czasie pracy są częścią systemu. Trzeba przyznać, że nie funkcjonuje to zbyt sprawnie (w rzeczywistości wiele z tych szkoleń to kompletna strata pieniędzy), ale pozwala nowym, ambitnym pracownikom wdrożyć się i nauczyć nowych rzeczy. Jeszcze ważniejsze jest to, że samo życie w Wielkiej Brytanii to jak tysiące darmowych lekcji języka. Polacy pracujący w sklepach i restauracjach bardzo szybko łapią właściwy akcent, poszerzają słownictwo i doskonalą umiejętność rozumienia najważniejszego języka biznesu na świecie. W rodzinnym kraju nie mają na to szans. Poza tym życie za granicą jest dużo przyjemniejsze. Londyn to chyba najciekawsze miasto na świecie. Polskie wielkie miasta są wspaniałe, ale nie można ich porównywać z Londynem. A polskie miasteczka bywają nudne i ponure (i tak wracamy do niskiego poziomu usług w sektorze publicznym). Tymczasem małe, prowincjonalne miasta w Wielkiej Brytanii oferują znacznie więcej, jeśli chodzi o życie nocne czy możliwości uprawiania sportu. A to ważne, zwłaszcza dla młodych ludzi. I na koniec sprawa optymizmu. Ludzie są w stanie wiele znieść, jeśli myślą, że ich życie zmierza ku lepszemu. A kiedy ogarnia ich pesymizm co do losów kraju, w którym mieszkają, albo co do szans na rozwój w tym miejscu, są bardziej skłonni rozważać radykalne zmiany, takie jak wyjazd za granicę. Pomimo silnego ekonomicznego wzrostu Polski, solidnej demokracji i silnych międzynarodowych sojuszy niekompetentni i kłótliwi politycy sprawili, że wyborcy wątpią, czy Polska jest na właściwej drodze. Łącząc te wszystkie czynniki, łatwo zrozumieć, dlaczego polskie służby publiczne nie mogą zatrzymać swoich pracowników. Oferują im bardzo źle płatne i źle zarządzane posady z niewielkimi szansami na jakikolwiek rozwój, pracę, w której znajomości liczą się dużo bardziej niż zdolności. Jakość życia i w pracy, i poza nią pozostawia wiele do życzenia. A przecież gdzieś indziej jest zupełnie inaczej. Poza tym najzdolniejsi i najlepsi wyjechali, więc warunki życia tych, co pozostali, stale się pogarszają. To jest zła wiadomość. A dobra wiadomość jest taka, że te problemy można rozwiązać. Polski sektor usług publicznych może się szybko poprawić, jeśli będzie lepiej zarządzany. To zdumiewające, że po 20 latach od czasu upadku komunizmu tak wiele placówek prowadzi się bez dbałości o interes "klientów" - pacjentów, uczniów i innych obywateli. Estonia zrewolucjonizowała usługi publiczne dzięki mieszance decentralizacji, liberalizacji (czyli współzawodnictwu), a przede wszystkim dzięki e-government [to elektroniczny system kontaktów obywatela z administracją publiczną]. Godny uwagi jest fakt, że nawet tak biedny i zacofany kraj jak Gruzja chciał pójść z przykładem Estonii i stworzył swój własny projekt radykalnych reform sektora publicznego, a Polska wykazała bardzo niewielkie zainteresowanie tym tematem. Dobry stan usług publicznych sprawia, że są one atrakcyjne dla ich użytkowników, a także przyciągają i zatrzymują dobry personel. Nauczyciele lubią pracować w dobrze prowadzonych szkołach. A dobra szkoła sprawi, że każdy rodzic mieszkający w okolicy dwa razy pomyśli, zanim zdecyduje się na pracę za granicą. Polska stoi teraz przed ważnym wyborem. Albo zdobędzie się na wysiłek i stanie się atrakcyjna dla własnych obywateli, nie tylko płacąc im godne pensje, ale oferując usługi publiczne na wysokim poziomie (jeśli nie natychmiast, to chociaż przedstawiając realistyczny program na nadchodzące lata). Celem jest tu zachęcenie tysięcy tymczasowych emigrantów do powrotu i wzbogacenia kraju o nabyte przez nich umiejętności, języki, poglądy i doświadczenie. Ten proces ma już miejsce w prywatnym sektorze, choć na mniejszą skalę: ludzie, którzy zarobili pieniądze za granicą, wracają do domu i rozwijają możliwości biznesowe, które tam udało im się tam podchwycić. Ale w sektorze publicznym do takiej sytuacji ciągle jeszcze daleko. Jeśli Polsce się nie uda, czeka ją dużo bardziej posępny scenariusz: błędne koło pogarszających się usług publicznych, których najlepsi pracownicy wyjeżdżają, kadra zarządzająca jest na coraz niższym poziomie, a jakość życia wszystkich obywateli gwałtownie się pogarsza. Do czego mogą doprowadzić złe rządy, ukazuje przykład południowych Włoch - wszechobecna mafia, wyludnienie i brak jakiejkolwiek nadziei. Polska sama musi rozwiązać ten problem. Unijne fundusze strukturalne wiele ułatwiają, ale nie zastąpią potrzebnej tu politycznej woli i wyobraźni. Demokratyczne naciski przez ostatnie 20 lat nie do końca przekonały polityków, że to ważne. Ale teraz miliony ludzi głosują w inny sposób - nogami. To powinien być sygnał, że należy działać szybko. *) Edward Lucas - korespondent brytyjskiego tygodnika „The Economist" w Europie Środkowej i Wschodniej, autor raportów o Polsce. W lutym napisał krytyczny artykuł o polskich władzach: „kłótliwy, uparty jak osioł polski rząd wbrew oczekiwaniom większości komentatorów przetrwał już prawie 18 miesięcy”. Romania's troubled president, Traian Basescu, should win a referendum on his impeachment. But then what? EX-COMMUNIST politics is often explained as a tussle between the crooks, the spooks and the idiots. That may be a touch insulting. But it is a fair account of the wrangling that has led to Romania’s referendum this weekend on the impeachment of the president, Traian Basescu. Even Mr Basescu’s closest supporters find it hard to praise the former sea-captain’s tactics. He has dumped seasoned advisers and picked unwinnable fights. He runs an oddly independent foreign policy, and depends too closely on Romania’s powerful and only half-reformed security and intelligence services. On the other hand, he has championed the crucial cause of anti-corruption. His opponents in Romania’s government, by contrast, approach the subject with a level of doublespeak worthy of the communist era. “We will continue and accelerate the fight against corruption,” promised the new justice minister, Tudor Chiuariu, when he took office a month ago. But his first move was to request the dismissal of a top anti-corruption prosecutor who was investigating senior members and supporters of the ruling coalition. The reasoning was that these probes were proving fruitless. “A prosecutor should be evaluated by the number of cases he has won. Until now, there have been no verdicts, which mean the cases are not solid enough,” the minister argued. He did not mention the reason for the delays: procedural wrangling by those being investigated. But the recent reforms to the justice system that paved the way for Romania’s accession to the European Union have taken sturdy root. The reactions among the prosecutors were so strong that the minister backed down. Dismissals will come only with the say-so of an independent judicial body, the High Council of Magistrates. Romania’s lawmakers have also ended a two-year wrangle by passing a bill setting up an agency to investigate politicians’ assets and conflicts of interest. That was a condition for EU membership; failure to get it going would have triggered sanctions from Brussels. But the newborn “Integrity Agency” has a serious weakness: it is not independent, but subordinated to the parliament that it is supposed to investigate. Yet the prime minister, Calin Popescu Tariceanu, hailed the new outfit as a great success, proving that his justice minister’s negotiating skills trumped the uncompromising style of his predecessor, Monica Macovei. She was widely admired abroad, but loathed by much of Romania’s chummy political class. Loss of zeal on the fight against corruption is worrying. America has firmly signalled to the government not to fire the prosecutor-general, Daniel Morar. 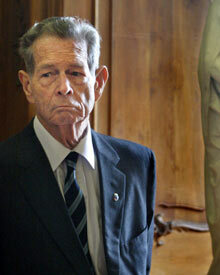 Since Ms Macovei’s departure, he is the strongest champion of the anti-corruption cause. The EU will issue a report in June on Romania’s progress since accession. It will pay particularly close attention to any failings at the new anti-corruption agency. But outsiders’ influence has its limits. Romania will need to clear up its political mess itself. It is hard to see how. Polls show Mr Basescu winning around 70% of the vote in this weekend’s referendum, though he also needs 50% of the electorate on his side to stymie the impeachment attempt completely. If Mr Basescu does poorly, the government, which was supported by 70% of the parliament in the impeachment resolution, may try to change the constitution to weaken the president’s position. No strong alternative government is in sight. The most likely outcome is that the political shenanigans will continue until the scheduled parliamentary elections in the autumn of 2008. That will do nothing to help Romania reform and modernise. Outsiders just hope it won’t slip back. ZIMBABWE is an odd choice to head the United Nations Commission on Sustainable Development. No one can doubt the sustainability of Robert Mugabe's regime: it has, regrettably, defied countless predictions of collapse. As for development, the country is certainly a striking case study—but of decline, not growth. Few countries offer more vivid advertisement for the connection between sound government and long-term prosperity. The commission's aim is a better life for the many. Zimbabwe is run to provide a high life for the few, involving looted farms and high-spending shopping trips to Dubai and Johannesburg, with increasing misery for everyone else. But look on the bright side. Few things are more dull than a worthy cause run by a do-gooding country. It is a fair bet that if, say, Sweden or Canada were chairing the commission, nobody outside the aid industry would hear a squeak about its doings over the next year. Zimbabwe's stewardship, by contrast, will attract much scrutiny. Journalists, donors and other critics will be searching for examples of misspent money or—even better—further examples of hypocrisy. The power of such a spotlight has already been demonstrated: Libya's chairmanship of the UN Human Rights Commission in 2003 helped force that body's transformation into something that—perhaps—requires slightly higher standards. Since then Libya has started to shrug off bits of its roguish reputation, voluntarily ending its nuclear programme. Chivvying the world's nastiest countries by putting them in charge of good causes is a promising principle. Unimaginative diplomats from west European countries and America are worrying whether Kazakhstan is a suitable country to become chairman of the Organisation for Security and Co-operation in Europe in 2009. Might that honour help nudge reform along? Far better, of course, to put the still more ghastly government of Turkmenistan in the chair. That closed, dictatorial country would find it hard to maintain its isolation through the hectic schedule of chairing a 56-member organisation. Similarly, putting some notorious narco-state in charge would electrify the UN's sleepily-run drug programme. Saudi Arabia could take over the UN's commission on the status of women. The inter-governmental panel on climate change could be overseen by smoke-belching China. Belarus, which ruthlessly sells weapons of all kinds to anyone with cash, could be asked to take over the UN disarmament department. Moving headquarters might help too: North Korea could inadvertently make an excellent champion of nuclear non-proliferation. The International Atomic Energy Agency's staff might find the austere delights of Pyongyang a bit of a contrast to the cosy comforts of Vienna, but the arrival of dozens of nuclear snoopers would certainly make it harder for the regime there to cover its tracks. Shifting UNESCO headquarters to Riyadh from Paris would highlight the dire state of publishing, science and education in the Arab world. Based in Beijing, the International Labour Organisation would find many more chains to loosen than it does in the workers' paradise of Switzerland. Western countries' weaknesses might benefit from exposure too: the Universal Postal Union could move to Italy. Of the places in direst need of a spotlight, however, Zimbabwe may be grim, but Sudan is even grimmer, especially its Darfur region, where government-backed militias are still killing people. Sudan has not signed up to it, otherwise the International Criminal Court could be packing its briefcases for Khartoum. Sadly, when it comes to regimes that serially abuse their people, there is plenty of competition. DEMONSTRATORS outside Parliament rarely wear togas and brandish placards written in classical Greek. They did this week. The reason was a decision by education bureaucrats to drop a national history exam for 18-year-olds. If the protest naught avails, ancient history will no longer be taught in English schools, for the first time since the original Dark Ages. The decision to axe the A-level was taken hurriedly and in secret, without consulting the schools that teach ancient history or the universities that like it. And it comes at a time when the decline in classics in schools has reversed. A recent book on Latin grammar, “Amo, Amas, Amat”, became a surprise best-seller. 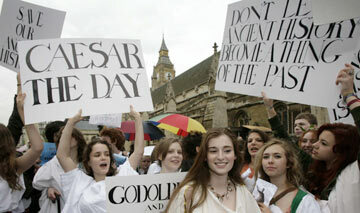 The number of state schools offering basic Latin has risen from 200 in 2003 to 459 today. Though some of the Thucydides-loving demonstrators were from elite private schools, others were from grungy further-education colleges. As they waited for Boris Johnson, the Tory education spokesman, to address them (in Latin), the pupil-protesters chanted “Long live Athens! Down with Sparta”. Fine sentiments. But remember what happened to Athens. OUTSIDERS like to decry Poland's ruling twins, sometimes as buffoons, sometimes as bloodthirsty inquisitors. Both characterisations of Lech and Jaroslaw Kaczynski, respectively president and prime minister, are unfair, but each contains a grain of truth. The twins' foreign policy has been inept, sometimes comically so. And, until it was struck down by the constitutional court last week, their vetting law seemed not only sweeping, but downright sinister. The Kaczynskis' initial reaction was to counter-attack. At one point they and their allies even seemed to challenge the constitutional court's legitimacy. In a bizarre intervention on the day of its ruling, a deputy from the ruling Law and Justice party, Arkadiusz Mularczyk, demanded a delay, producing hurriedly obtained secret-police files on some of the judges. Now the government has accepted the court's ruling, which guts the central provisions of the law. Journalists and academics are excluded, and the penalty for non-compliance—a ten-year ban from a person's profession—was also struck down. This has avoided a constitutional crisis, but left the question of what to do with Poland's millions of locked-up secret-police files, which occupy 80km (50 miles) of shelf-space. Secrecy allows the wicked to pose as blameless, and offers much scope for blackmail. The emerging consensus is to replace the vetting law with an open-archive policy. One idea is to allow access by everyone to everything. Yet the files contain much private information, accurate or not, on things like medical conditions or sexual indiscretions. So a more likely answer will be to open the files to public scrutiny with non-political material expunged. But by whom? Some suspect that the whole subject will now get bogged down in the question of reforming the management of the archives, delaying embarrassing revelations for many years. Behind the row lie some sharply different views of history. The Kaczynskis believe that, after communism collapsed in 1989, the transition to democracy was botched—maybe even sabotaged—by elements from the old regime. They yearn to bust the crony-capitalist arrangements that have grown up between business, officialdom, the media and leftist politicians. Mr Geremek's 20-year stint in the opposition counts for little: how, critics ask, did he get the juicy job of running the Polish Cultural Centre in Paris in 1960, at the height of the cold war, without having ties to Polish (or Soviet) intelligence? Others say that the Kaczynskis themselves are prisoners of the suspicious, confrontational mindset engendered by totalitarianism. Justice is one thing; revenge another. Since 1989 Poland has tamed inflation and built a thriving market economy. Now it needs to modernise its public services and play a constructive role in Europe. Ending the heated controversy over the vetting law offers the best chance of concentrating on that. THESE are bleak and unsettling times if you believe that Russia and the West ought to be better friends. By common consent, the mood has not been so icy since Soviet days. Russia says it feels encircled by NATO expansion and proposed American missile defences, patronised on human rights and assailed by double standards. The West finds Russia's pushy foreign policy, increasingly authoritarian manner and growing grip on its energy supplies alarming. A summit late this week between the European Union and Russia's Vladimir Putin looks likely to agree on nothing; ex-communist countries such as Poland and Lithuania are determined to veto talks on a new partnership agreement so long as they are subject to Russian trade sanctions and other pressure. Visits earlier in the week to Moscow by the American secretary of state, Condoleezza Rice, and by Germany's Frank-Walter Steinmeier, produced only a half-hearted promise to cool some of the more heated rhetoric (see article). Doing that is no bad thing—but the worst words have come from one side only. Mr Putin recently seemed to liken America to Nazi Germany. 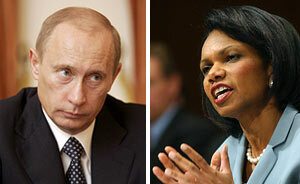 Ms Rice merely called trends in Russia “troubling”. The American media are harsher—but, perhaps contrary to Kremlin belief, she is not to blame for that. The idea of Russia being tricked and humiliated by a mighty, well-organised Western camp led by a power-hungry America is preposterous. The truth is that Russia, having first scared its neighbours into NATO by its bullying behaviour, is currently outmanoeuvring a divided and indecisive West on almost every front—and especially on energy. Last week Mr Putin struck a crucial if provisional deal with Kazakhstan and Turkmenistan on routing their gas exports to Europe via Russia. Along with his recent schmoozing of Algeria and Qatar, this threatens to exacerbate Europe's energy insecurity, kyboshing the hope of importing large quantities of Central Asian gas without Russian involvement. The idea was to hook up Europe to the region's gas reserves with a new pipeline under the Caspian Sea, and then an existing one through the Caucasus and Turkey. The obstacles to the Caspian scheme are formidable; the Kremlin can offer the Turkmen and Kazakhs incentives, such as unquestioning support for their domestic policies, that the West cannot. But the existing Caucasian pipeline once looked just as unlikely; political will turned it into reality, and could still save the Caspian scheme. Russia can hardly be blamed for maximising the economic benefits of its energy riches and geography; every other poor, resource-rich country does the same. But that does not mean that Europe should simply acquiesce. Whatever the pipeline arrangements, it should aim for greater resilience in the face of Russian pressure. It should liberalise its own energy industries, pay for better gas storage, build more interconnecting pipes and power lines, and invest more in liquefied natural gas terminals. The deeper and more liquid Europe's energy markets are, the harder it is for an outsider to manipulate them. Most important of all, the West must resist Russia's attempts to pick and choose among its customers. The Kremlin seems not fully to accept that its Baltic, Balkan and central European neighbours are as independent as the countries of western Europe are. The centrepiece of Russian policy is to strike bilateral deals: with the big members of the EU, notably Germany, and with weakly governed new members such as Hungary, Latvia and Bulgaria. By seeming to accept this divide-and-rule policy, the Europeans undermine themselves. That is why the German-backed gas pipeline under the Baltic, and the agreement of Hungary and others to a Russian gas pipeline through the Balkans, are so damaging. Russia's combination of ruthlessness, ambition and wealth is unique and scary. But it should not be intimidating. Europe should accept that a bad deal with the Kremlin is worse than no deal at all. Germany, in particular, needs to be less fixated on friendship with Russia, no matter what. 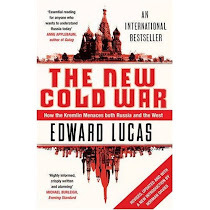 But there is no need to declare a new cold war, whether over energy supplies or more generally. Europe's dependence on Russia for gas and oil is sure to continue, but need not be harmful. After all, it makes Russia dependent on Europe as its main market; talk of switching supplies to China is a pipedream in the absence of pipelines, which take both years and oodles of money to build. The way to bring more equality to the relationship of bullying supplier and anxious buyer is for Europe to stand united against Russian attempts to divide it. UNTIL the collapse of communism, being an exiled monarch was merely thankless. Since then it has been cruelly disappointing. In Albania, Georgia, Hungary, Montenegro, Russia and Serbia the monarchist cause has at best crashed and burned—or more often failed to ignite at all, leaving royal pretenders (or pretend royals) stranded on the eurotrash heap of history. In Bulgaria, Simeon Saxcoburggotski (or ex-King Simeon II) was briefly a popular prime minister. But now he languishes in an uncomfortable coalition with the ex-communists, heirs to the party that exiled him and murdered his followers. The classiest act, however, is Michael of Romania: dignified, modest and sharpwitted; ambitious for his country, but not for himself. He is one of only three surviving heads of state from 1945 (the others are ex-King Simeon, who was only seven when the war ended, and Mohammed Zahir Shah, once King of Afghanistan and now, aged 92, back home as “Father of the Nation”). Michael makes no claims to his throne; in return, Romania’s current rulers treat him with the courtesies due to a former head of state. Bursting with questions, your columnist hurried to a London hotel for a few moments of monarchical nostalgia. But what does one call a king without a country? For a representative of a republican newspaper, “Your Majesty” seemed too deferential. “Sire” was clearly over the top. “Sir” seemed too downbeat. “Mr Hohenzollern [the royal family's surname]” would be insulting. In a language such as German, where spoken as well as written salutations matter, the problem would have been insuperable. But English is flexible: “you” proved just fine. The real problem, though, was not addressing Michael correctly, but understanding him. A speech impediment turns his idiomatic American into a diffident mumble. His wife Anne, by contrast, speaks with crystalline precision. An exiled Greek princess, she honed her English as a sales assistant at Macy’s in New York. So palace coups gave way to earning a living: initially by market-gardening in England, with some chickens on the side—“Rhode Island Reds and Sussex”, notes his wife, enthusiastically. Most royals don’t get the chance to keep chickens. Unlike Baltic and Ukrainian exile leaders, Michael wisely shunned cold-war attempts to stoke armed resistance in his captive homeland. “In the 1950s the Americans wanted to use me to train a whole bunch of people and parachute them in. I said ‘no—what’s the point?’”. That is a sad theme for eastern Europe, and perhaps an ominously contemporary one: almost as bad as having the Kremlin as your implacable enemy is having the West, absent-minded and unreliable, as your friend. THE misnamed Hotel Druzhba (Friendship) used to be the only place to spend the night in Tiraspol. For connoisseurs of truly dismal Soviet-style rudeness, apathy, squalor and clashing shades of muddy pastel, it is still unmissable. As a place to stay, its noisy, draughty rooms, with their nylon sheets, uneven tiles, flimsy locks and eccentric plumbing, leave a lot to be desired. Even Dmitri Soin, the chief Transdniestrian cheerleader and director of the magnificently named Che Guevara School of Political Leadership, shows visible relief that his foreign visitor’s enthusiasm for authentic local flavours does not stretch to the Druzhba. His youth movement, Proriv (Breakthrough), apes the pro-Western flagwavers of the “coloured revolutions” that toppled autocrats in Georgia, Ukraine and elsewhere. Proriv’s headquarters look flashy, with elegantly designed logos (featuring Mr Guevara) and lots of computers. But the aim is not to promote Western-style democracy, rather, its opposite: Proriv is much closer to the pro-Putin youth movements of Russia. The accent is on fun, and a positive and loyal portrayal of the motherland. 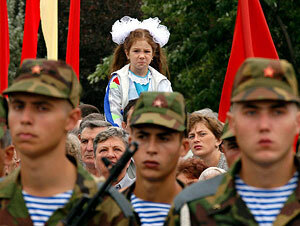 Transdniestria is a modern, vibrant, multi-ethnic society, happily linked to dynamic, prosperous Russia. A much better bet than muddy Moldova. The real prize is not meeting the pony-tailed, yoga-loving Mr Soin, but his boss, the Transdniestrian security chief Vladimir Antufeyev. How to reach him, in his secrecy-shrouded, fear-inducing ministry? Even the gutsiest independent journalists in Transdniestria do not have a phone number for his office. The so-called ministry of foreign affairs shows no inclination or capability to arrange a meeting. Time is running short. The best approach is the simplest: go to the ministry of state security and ring the doorbell. It seems a trifle risky. This is not a building which outsiders normally enter willingly, especially Western journalists who write nasty things about gangster-ridden separatist enclaves. A friend cautions strongly against: it will be fruitless; the tea will contain polonium. A tiny spyhole opens, then a thick steel door; a soldier, in the uniform of the special forces, takes a proffered passport and visiting card. Next stop is a long wait in a tiny, interrogation room, fitted out with a KGB version of IKEA furniture: flimsily constructed in pale plastic veneer. Steel shutters on the windows have slits for the muzzle of a gun, just in case. Then General Antufeyev’s secretary appears, ideally cast for the role in elegantly cut battledress, fishnet stockings, high heels and scarlet lipstick. She beams. The minister is available in 40 minutes. The soldiers beam. If they had been hoping to be told to take this unwelcome visitor on a one-way trip to the dungeons, they don’t show it. Sadly, the canteen is not available, but an excellent café round the corner sells a passable borscht and dumplings. It is hard to imagine anywhere else in Europe where an impromptu request to meet the chief spook would meet such an accommodating and friendly reaction. Face to face, General Antufeyev is charming and hospitable, not the sinister brute of popular repute. Coffee is offered at once; then a bottle of brandy as a souvenir. In crisp, vivid Russian he outlines his worldview: Transdniestria is a bastion against western hegemony; Moldova is intolerantly ethno-centric, pervaded by Romanian nationalism, and consequently unattractive to the liberty-loving Russophones of Transdniestria. It is rather like talking to top Stasi people in East Berlin in 1988: the logic is fine and the brainpower impressive; but the assumptions are mistaken. In truth, Transdniestria is being squeezed: Russia is impatiently cutting back subsidies; Moldova, albeit slowly, is becoming more attractive. General Antufeyev will need all his wiles to survive. IN THEORY, Transdniestria is scary. It is the sort of place where thugs in leather jackets tote their guns in restaurants, a place where anything can be smuggled, laundered, bought or disposed of. Bad things can happen to the unwary or unlucky Westerner, and if they do, nobody will help you. Chisinau-based diplomats shun the illegal, unrecognised “Transdniestrian Moldovan Republic”. The place is run by a Ministry of State Security—”MGB”, for its Russian initials—which has close and unexplained ties to powerful people in Moscow. That outfit is run by Vladimir Antufeyev, who—in the eyes of his enemies at least—is a villain straight out of a James Bond film. He is physically imposing, brainy, ruthless and has a suitably chequered background. He arrived here years ago under an assumed name, having staged an unsuccessful putsch in Latvia. Driving from Chisinau to the Transdniestrian capital, Tiraspol, takes about 40 minutes. The “border” is the ceasefire line left over from a short, fierce, pointless war in 1992 between swaggering ethno-nationalist Moldovans and diehard Soviet loyalists, which left the latter in charge of Transdniestria. You pass Moldovan customs officers, then Russian peace-keepers, then Transdniestrian customs, then the border control. The checks are cursory. If your papers are in order, everything is OK. But what does it cost to get the right papers? One aim of this trip has been to see what the market is in forged or corruptly-obtained passports. A few years back your correspondent failed to take the chance, in the bazaar in Faizabad, of buying a spanking new Afghan passport for just $40, and has regretted it ever since. So far, on this trip, the quest for a passport has been fruitless. In Bucharest they are said to be on sale in Moldova, no problem. Moldovans say that the trade there has dried up, but you can buy any documents you want in Transdniestria, no problem. But even the sleaziest looking taxi drivers and the barmen in the deepest dives of Tiraspol look shocked at the idea. Odessa in next-door Ukraine, they say, is the place for all kinds of papers, legal and illegal. For a place that bangs on endlessly about its statehood, Transdniestria is pretty feeble when it comes to the details. The first stop is the foreign ministry. In most countries, the foreign ministry is a landmark. This one is tucked away in a backstreet. It lacks a national flag, a sign, and even a door bell. Banging on what looks like a garage door produces reluctant admission that this is the foreign ministry, and eventually access to a dusty car park that leads on to a nondescript villa. Inside, it all seems unfinished. Bare wires dangle from the ceilings, some with lightbulbs, some without. It smells cold, damp and lifeless. “Have you just moved in?” “No, a couple of years ago” comes the answer. The main road, October 25th St, tells you much of what you need to know. The most common shop signs are for money exchange—reflecting the inflow of remittances from émigrés that keep both Transdniestria and Moldova afloat. Transdniestrian roubles are dingy, scruffy scraps of paper, which manage to make even Moldova’s tatty currency, the lei, look respectable. The coins are tiny discs of aluminium. A hugely ornate new bank building shows the profits you can make from shovelling money into, and around, a place where international financial controls don’t bite. A short way away is the headquarters of the MGB. Across the road is a fast-food joint that, oddly, is owned by the son of a senior Moldovan politician. The two sides may hate each other on one level, but on another their interests overlap in the most curious ways. MOLDOVA is run by Vladimir Voronin, the only serving head of state in the world to have won a contested election on a communist ticket. His views have changed a lot from 2001, when he said he would make his country the “Cuba of eastern Europe”. Now he is pro-market and pro-European Union. He’s pro-democracy too, in theory. But the justice system is dismal and the security services powerful. The authorities treat journalists they don’t like with silly vindictiveness. The opposition finds it hard to get on telly: in short, it’s a typical bureaucratic and fairly authoritarian presidential republic, a bit like Ukraine used to be before the “Orange Revolution”. The story the Moldovans want to tell is of their conversion to radical economic reform. It is certainly needed. Moldova is the poorest country in post-communist Europe; 47% of the population lives below the poverty line. At least 25% of the working age population has emigrated. Their remittances keep the place going. Now Mr Voronin has announced an amnesty for illegal capital and unpaid taxes, and a sweeping tax cut for business. The idea, ministers and officials say with unconvincing confidence, is to make Moldova like Estonia. Dealing with the Moldovan government does not evoke memories of Estonia. Soldiers patrol the corridors in Soviet-style uniforms, saluting as minor bureaucrats go by. According to people who deal with it, the bureaucracy is old-fashioned and often corrupt. Ministries are run as Soviet-style hierarchies, where connections and status matter far more than good ideas, and everyone guards decision-making power and information jealously. No neighbouring country plays Finland’s role. Most outsiders that come to Moldova from neighbouring countries offer bribes, not advice. The economics minister wants to make the country a “logistics hub” for the Black sea region. Not a bad idea—but it will be hard to do that without allowing foreigners to buy land freely, or to compete with obese sacred cows such as the national airline. Yet things are changing. People now move from Transdniestria to work in Chisinau. It used to be the other way round: in Soviet times Transdniestria was industrialised, whereas Moldova specialised in low-value-added agricultural produce. Moldova is even facing a huge influx of cash over the next few years: $1.2bn was pledged at a donor conference last year. Every big international outfit seems to have an office in Chisinau. Some are run by inspirational people. Others seem to have been sent to Moldova as a punishment, or at the fag-end of their careers. Some foreign missions are run by locals of questionable outlook. Given Moldova’s exceptionally weak institutions, it is likely that some donated money will be stolen. Quite a lot will merely be wasted. Some will never be allocated at all, because Moldovan officialdom can’t get its act together. But some may actually do good. This week economist.com is featuring my five-part diary of a recent trip to Moldova, Romania and Ukraine. MOLDOVA is not only the poorest ex-communist country in Europe; it is also last in the queue for love and attention. It lacks central Europe’s glorious culture, the pungent romance of the Balkans, the charm and excitement of the Baltics, or the huge strategic importance of Central Asia and the Caucasus. Its main role is that of a country so obscure that it can safely be ridiculed, as it was in a book about a hapless British comedian’s attempt to play tennis with the national football team. Moldova is indeed flat, small, isolated, and ill-run. But it is not ridiculous. Its sadnesses spill over to other countries in the form of smuggling and prostitution. Bits of it—chiefly the breakaway puppet state of Transdniestria—are sinister. Its fate is tremendously important. As it wobbles between east and west, Moldova may be the first country that the Kremlin wins back from the west since the 1970s. Simply getting there is quite hard. Deplorable state interference (to protect the national carrier) means that the low-cost European airlines that fly to the farthest corners of countries such as Poland don’t serve the Moldovan capital, Chisinau. Municipal corruption means that no western hotel chains have opened. The best one is an ex-brothel, built for Turkish clients. After four lucrative years, the owners changed its name and went respectable, more or less. The best way to get to Moldova is from Romania. Ties between these two countries ought to be the closest anywhere in eastern Europe. They share, broadly speaking, a common language and history. Moldova was part of Romania until 1940, when Stalin grabbed it as part of the Nazi-Soviet pact. Now the mood is icy. Romanians mostly find it hard to think of Moldova as a separate country: rather the same way many English used to feel about Ireland, and still do about Scotland and Wales. Romania’s beleaguered (and currently suspended) president, Traian Basescu, a cheerful former sea-captain, sees Moldova as a failed experiment that would be much better off rejoining Romania. His views would be fine in his old job, discussed in a lively harbourside bar, lubricated by a few glasses of Romania’s national drink, tuica. Coming from a head of state, amid the delicate levantine gold filigrees and white plaster of the former royal palace, they sound crass. Only the most flimsy euphemisms disguise his real views: Moldova is run an incompetent provincial Soviet elite that has lost the confidence not only of the outside world, but also its own people. They are signing up for Romanian passports en masse—he reckons 800,000 out of a population of 4.5m. Romania’s newly won membership of the European Union makes its citizenship—available to most Moldovans—irresistibly attractive, and the process of unification unstoppable. Yet a few moments’ thought show the difficulty with Mr Basescu’s simplistic notions. Romania struggled to get into the EU and is now struggling to survive there. Moldova has far worse problems, and is not even in the waiting room for membership. The last thing the EU wants is another chunk of dirt-poor, ill-run, ex-communist nuisance. What would happen to Transdniestria, the mainly Russian-speaking territory that was stitched to Moldova in Soviet times, and now tries to be independent? Crucially, reunification with Romania is not popular in Moldova. 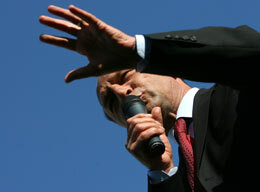 Mr Basescu’s views may be coloured by the rapturous reception he received from his fans there during a recent visit. But less than a sixth of the population declare themselves as “Romanians”. The majority have got used, over the past 50 years, to living in a separate country. They do not want to go back to being a neglected province of Greater Romania.